1. Download our template here. 2. If you chose to design using software, reupload the template with your finished product and fill out the form below. If you chose to design using another medium, print out the template, fill it in with your concept, scan/take a photo of it and then reupload the document and fill out the form below. 3. Remember to read the terms and conditions. If you are under the age of 18, you will need permission from your parent or guardian to participate. 4. 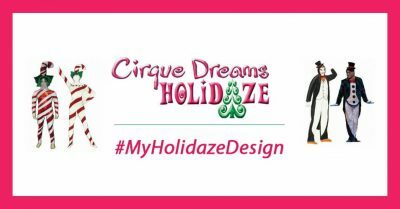 Share your image on social media and use the hashtag #MyHolidazeDesign to increase your chances of winning. If your design is selected, you will be awarded 4 tickets to the show and your piece will be turned into a real life costume and will be worn by a performer on stage during Cirque Dreams Holidaze at the Broward Center for the Performing Arts December 26 – 30. Contest runs through December 8, 2017. For tickets and info about the show, click here. Here are some links to websites that we link to because we feel they are really worth visiting. Wonderful story, reckoned we could combine some unrelated information, nonetheless actually worth taking a search, whoa did a single find out about Mid East has got much more problerms as well. Wonderful story, reckoned we could combine some unrelated information, nevertheless truly worth taking a look, whoa did 1 understand about Mid East has got additional problerms at the same time. Always a large fan of linking to bloggers that I really like but really don’t get quite a bit of link really like from. Although web sites we backlink to beneath are considerably not connected to ours, we feel they are basically worth a go through, so have a look. The data mentioned in the report are a number of the very best available. Always a large fan of linking to bloggers that I appreciate but really don’t get a great deal of link like from. Always a huge fan of linking to bloggers that I enjoy but really don’t get a good deal of link enjoy from. Always a massive fan of linking to bloggers that I adore but really don’t get a good deal of link love from. The information and facts mentioned inside the article are a number of the most effective available. Wonderful story, reckoned we could combine a number of unrelated information, nonetheless truly really worth taking a look, whoa did one master about Mid East has got much more problerms at the same time.